When you have a gunslinger’s reputation, opposing teams are all too happy to fit you for a straightjacket. 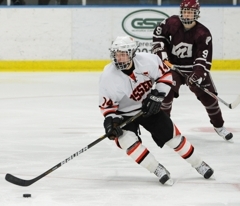 Osseo’s Tim Bonner was chained and padlocked for more than two periods on Friday, Feb. 25, in the Orioles’ Section 5AA quarterfinal matchup with Anoka. No problem. No problem at all. The senior forward is a modern-day Houdini when it comes to wriggling out of tight spots, and with No. 3-seed Osseo clinging to a one-goal lead over No. 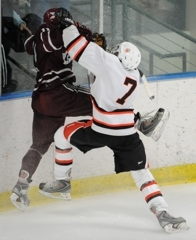 6 Anoka, the Orioles’ third period certainly qualified as a great escape. 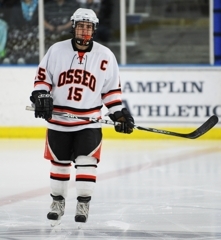 Bonner, the senior forward who figures to own every school scoring record by the time his career ends, scored twice in the third period as Osseo (17-9-0) erupted for five goals en route to a 6-0 triumph over the Tornadoes (10-16-0) at the Ice Forum at Champlin in Champlin Park. The 5-foot-8, 175-pound center’s second goal in the final period was vintage Bonner, meaning brains often gets the best of brawn. Bonner headed straight toward the net on a face-off in the Anoka zone, slipping past a defender, gaining control of the puck and quickly firing a shot between the pads of Tornadoes goaltender Jeff Ramstad. It was Bonner’s 34th goal of the season, two more than the previous mark set by Kevin Armstrong during the 1969-70 season. “He did everything perfectly,” Osseo co-head coach Kevin Willey said. “He set everyone up by saying, ‘Hey, I’m going to draw it back to (a teammate). They thought he was going back and instead he went forward. Turns out Bonner was fooled last season on the same play by former Andover scoring whiz Cal Decowski. Although Bonner was beaten on the play by his Northwest Suburban Conference rival, he logged the memory for future use. “He said he took a play out of Cal’s book on that one,” Willey said. Bonner’s 65 points this season leaves him one short of Travis Morin’s record of 66 set in the early 2000s. Bonner, a varsity regular since he was a freshman, already owns the school’s career scoring mark. 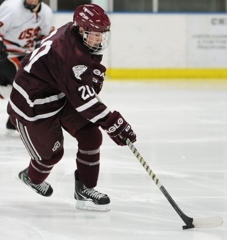 A standout in the Upper Midwest High School Elite Hockey League in the fall, Bonner said he hasn’t been paying close attention to his scoring totals and where they stand in regard to school records. 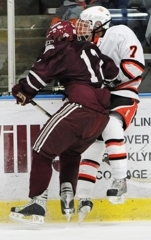 Bonner’s first goal in the third period, a rocket into the upper corner, was part of three-goal flurry that spanned 64 seconds and ended with the Orioles leading 4-0. 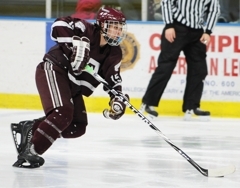 Anoka, which had lost to Osseo twice during the regular season, never got goal. The Tornadoes never got that energy boost, either. Meanwhile, the Orioles picked up the intensity as the game wore on. Bonner, especially, played his best in the late stages. He said he’s not ready for his season to end. Osseo scored three goals in a span of 64 seconds in the third period as it cruised to a 6-0 victory over Anoka on Friday, Feb. 25, in the quarterfinals of the Section 5AA playoffs at the Ice Forum at Champlin in Champlin Park. No. 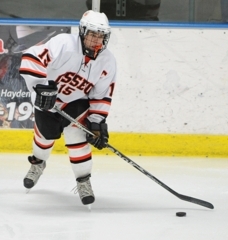 3-seeded Osseo (17-9-0) led 1-0 in the third period when senior Casey Cardille, senior Tim Bonner and junior Tyler Dahlberg scored in succession for the Orioles as they cruised to the victory over the No. 6 Tornadoes (10-16-0). Osseo plays No. 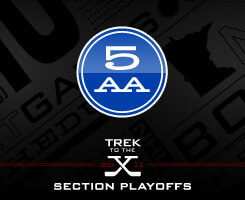 2 seed Blaine in the section semifinals on Tuesday, March 1, at the State Fairgrounds Coliseum in St. Paul. 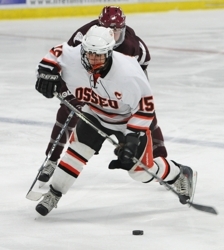 Bonner, Osseo’s all-time leading career scorer, finished with two goals and an assist to give him 65 points this season. 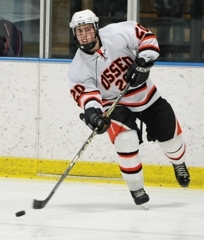 Osseo junior Aaron Dolby scored the only goal of the opening period and, in the third, made a 100-foot-plus pass up the center of the ice that sprung Dahlberg for a breakaway goal. Senor Jared Mol made 17 saves to earn the shutout for the Orioles. Anoka senior goaltender Jeff Ramstad made 34 saves. The junior defenseman scored the only goal through the first two-plus periods, made the game’s most gorgeous pass and dished out several board-rattling hits. He also was a big part of the defensive effort that limited Anoka to 17 shots, most all of them from long range. The Orioles’ Mr. Everything will most likely hold every school scoring record when his career is finished. Bonner, a senior forward who is in his fourth varsity season, scored twice and set up another goal in a typical high-performance outing. With the Orioles nursing a 1-0 lead the third period and needing something big to happen, Cardille, a senior co-captain, took matters into his own hockey gloves by weaving out of the corner and to the front of the net. Once he got in scoring position, he popped the puck into the goal and kick-started Osseo’s third-period eruption.